Using DigAlert Notifications, our SMS service, brings you closer to the information you need. No hold times, no guess-work. All you need to get started is a phone with a text-messaging plan. Text "HELP" to DIGALT (344 - 258) to get started. options Receive a list of commands that are currently available. 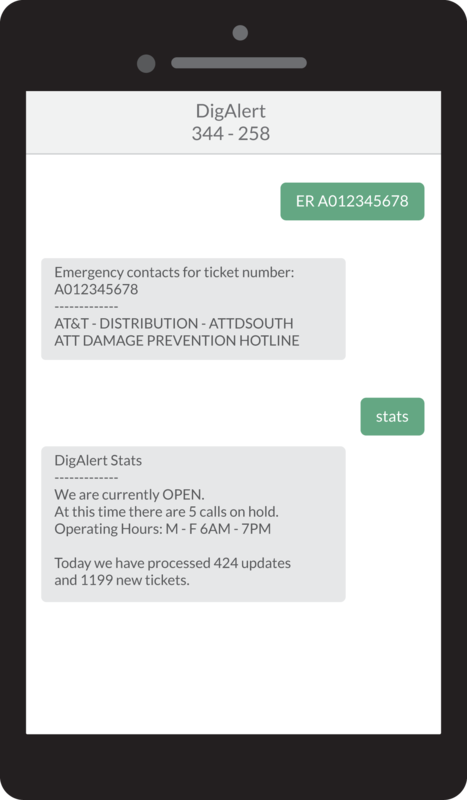 stats Receive DigAlert stats that include whether we are open, number of calls on hold, and more. ticket A12345678 Receive details for your ticket. er A12345678 Receive emergency contacts for ticket specified. vacuum A12345678 Receive vacuum contacts for ticket specified. new ticket Receive a link to DigAlert Direct to create a new ticket online. renew Receive a link to DigAlert's Renewal Express to renew 1 or more tickets online. apps Receive links for DigAlert's mobile apps. law Get links to CA Gov code 4216.
color codes Receive APWA color codes. website Receive a link to our website. feedback [message] Leave us feedback regarding our apps and services.